Can you make a living from proofreading? Definitely! I do it, my cohorts do it, and you can, too. As long as you’re committed and willing to hustle to find clients and work, you will succeed. Just like anything you do in life, you have to work hard to reach your goals. Proofreading is no different. In this post I share how I supported my family on my proofreading income while my husband went back to school. I’ll also discuss how you can make a living as a proofreader. When my husband went back to school, it was a big decision for us in many ways. We had just become first-time parents, and neither of us were working. I had taken a year off work so I could take care of the baby, and my husband had just closed down his business. It was never a question of if but when he would go back to school to pursue his lifelong goal in his field. We agreed that it was best to do it while our son was still a baby, so any changes that arose wouldn’t impact him too much. We decided it was best for my husband to be a full-time student while I worked from home and supported the family. I didn’t want to get an office job and put our son in day care. Day care in our city is very expensive, and I wanted to stay home and enjoy being a mother. Plus, I really don’t like working 9 to 5 in an office! We live in Canada, so we didn’t have to worry about medical bills, and we had savings that we used to cover tuition and other school costs. Other than that, I was responsible for the mortgage, utilities, groceries, baby supplies, and other extras. So for the next five years I supported my family solely on my income as a freelance proofreader. Those who know my story know that I’ve been a freelance proofreader for over 10 years—15 total when you include my in-house position. As a result, I didn’t really have any fears about the financial aspect because I knew it was possible to make a full-time income from freelance proofreading. I have to admit that when it was time to go back to work I was worried. Before my due date, I had contacted my clients to let them know I’d be taking a yearlong break from work. What if my former clients had found proofreaders they were happy with and didn’t want to work with me anymore? What if they were outsourcing their proofreading for dirt cheap? I reconnected with my old clients and put out feelers with my network. I emailed everyone and made them aware that I was back in the game and was available for freelance work. I also made sure to mention that I was open to referrals if they knew someone who could use my services. I was fortunate that I had longtime clients with whom I had built strong relationships. They were happy I was back, and I was able to fill up my work schedule right away. Keep in mind that I had put in my dues (8 years by this point), so please don’t read this and feel pressure to have your work schedule booked up asap! How Much Do I Make A Month? While this is a personal question, I know my answer would be very helpful to you in determining if you could make ends meet, as well. However, we’ve been victims of identity theft and financial fraud, and for that reason I’m not comfortable sharing my income. If you’ve ever been in my position you know how even sharing your real name in a public space like the internet is a big deal! So while I can’t share the dollars, I can give you an idea of how my income provided for us. Like I mentioned before, I make enough to cover all household and living expenses. I’m also able to pay for extracurricular activities for my son like karate, camp, and art lessons. We’re able to enjoy family activities and entertainment. The reason why I’m sharing this is to let you know that proofreading is a legitimate career that can provide. You can succeed freelance proofreading or working for a company. If you’re contemplating working as an in-house proofreader, according to Salary.com the median annual salary of a proofreader in the US is $49, 258 (2017), with the average range between $43K – $56K. There are several ways you can work as a proofreader. You can freelance, work in-house, or find full-time remote work. And if you want to learn more about proofreading and working from home, I’ve got FREE masterclasses for you! Freelancing gives you more freedom and flexibility in your schedule so you can focus on other areas of your life. Don’t turn down one-time projects. They’re always worthwhile because not only is it money, but experience, and another future client you can reach out to. Cultivate your professional relationships by staying in touch. Never look at a client as just someone you worked for once, and connect with them on LinkedIn. Do great work so clients will return and refer you to their network. Employ copyediting skills when necessary, which shows clients you really care about their content. Clients appreciate that you understand their message and context. If you just go through a project correcting spelling and punctuation, you aren’t doing your due diligence as a proofreader. To make yourself more marketable, and to meet the growing expectations of proofreaders, you need to know some basic copyediting skills. That’s why I created my course High-Level Proofreading Pro to teach you both proofreading and copyediting, and to help you gain professional-level skills and knowledge, straight out of the gate. If you don’t want to freelance and hustle, then maybe a full-time in-house position is better suited for you. You’d have a consistent pay cheque, benefits, and a set routine. In-house proofreaders work for businesses where content plays a part in their strategy or product development, and who are generating content on a regular basis. That could be manufacturers who create guides, packaging, and product descriptions; and businesses that need copy proofread, like marketing and communications agencies. 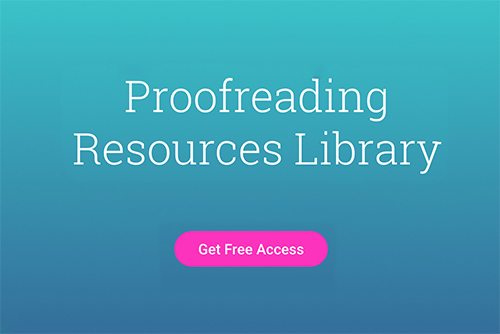 Publishing houses, the finance sector, educational institutions, and administration are just a few more examples of where you can find in-house proofreading work. Remote work is also on the rise. People are choosing to go remote and more companies now are allowing employees to work remotely. A remote job would mean that you’re working for one client, just like a full-time position, except it would be from home or wherever you choose. Remote workers usually also receive benefits. This is a legitimate fear for anyone starting a new hustle, not just proofreading. Are there a lot of proofreaders out there? Yes, but don’t let this scare you. See it as an indication of how much of a demand there is for proofreaders. Also start thinking how your skills are going to differentiate you from every other proofreader who can use a dictionary. There is a lot of content being generated on a daily basis, and it’s only going to rise. And content is becoming more powerful and being utilized to drive sales. My husband has graduated and now has a full-time job, but I don’t have any plans to cut back on my workload. And while he wants me to relax and work less, I’ve actually taken on even more work (crazy, right?). In addition to my proofreading and editing work, I’m also running this site and teaching students. I’ve learned that the fear of “not making it” holds back a lot of people. There is no guarantee for anything in life. If you want to start freelance proofreading as a full-time job or as a side hustle, my advice to you is don’t wait. From my own personal experiences, and from students I’ve trained, the longer you wait, the more you’ll wonder, the sooner you wish you had started. To make a living as a proofreader you need to learn the necessary skills, stay committed, reach out to your network, and market yourself. Do those things, and you’ll get there. You left out a word in the first sentence of your paragraph under CONCLUSION. Sorry I can’t stop myself from proofreading everything I set my eyes on. You supply great information. Keep it up! I’d love to do this full time freelance. Can I ask how long it took you when you first started? Thanks for sharing this. It’s very inspiring to know that it is possible!